AUGUSTA, Ga. (CNS) — Saying “justice needs to be tamed by mercy,” Bishop Felipe J. Estevez of St. Augustine, Florida, and two brother bishops called Jan. 31 for the state of Georgia to drop the death penalty in the case of accused priest killer Steven J. Murray. 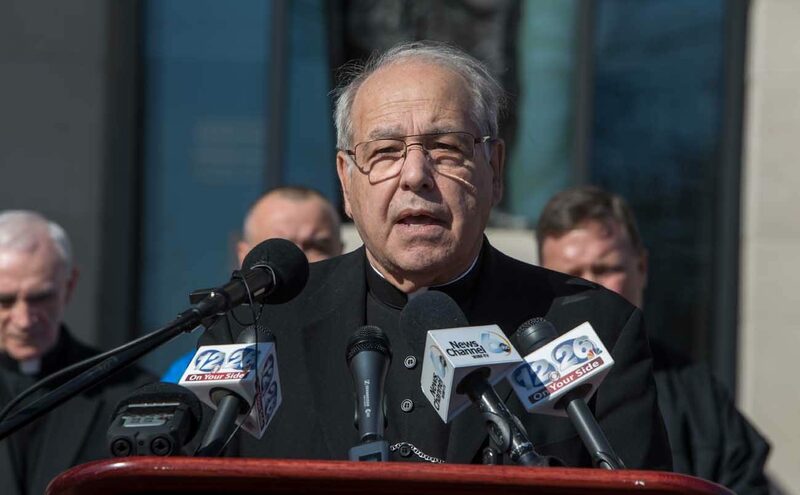 Bishop Estevez, Archbishop Wilton D. Gregory of Atlanta and Bishop Gregory J. Hartmayer of Savannah, along with priests, deacons and other supporters, gathered outside the Richmond County Courthouse in Augusta to issue their appeal. Murray, 29, has admitted in interviews to killing Father Rene Robert, 71, a priest of the Diocese of St. Augustine, who befriended him as part of his prison ministry. He is charged with first-degree murder, which carries a sentence of life or death. On April 11, Murray kidnapped Father Robert, forced him into the trunk of his car and then allegedly shot him multiple times in rural Georgia. Murray was arrested in South Carolina driving Robert’s stolen car. District Attorney Ashley Wright said she would seek the death penalty against Murray despite pleas for a life sentence from the church and Father Robert himself. In 1995, Father Robert signed and had notarized a “Declaration of Life,” stating that he opposed the death penalty for any killer. It was kept in his personnel file. He stated that should he die as a result of a violent crime, he did not want the individual or individuals found guilty of homicide for his killing to be subject to, or put in jeopardy of, the death penalty under any circumstances, no matter how heinous their crime or how much he may have suffered. Wright has recently been named a Superior Court judge. After the news conference, the bishops talked privately to Hank Syms, acting district attorney, and Bishop Estevez gave him petitions with 7,400 signatures. Bishop Hartmayer spoke on behalf his religious order, the Franciscans. Father Robert was ordained a Franciscan and later became a diocesan priest who lived in the spirit of the religious order, he said. Archbishop Gregory said he was joining Bishop Estevez’s appeal for mercy. The bishops said that if Murray is convicted, he could be sentenced to life without parole. “We hope if he is granted a life sentence that he find within his own heart and spirit to ask for God’s forgiveness. That could take many years, but we are asking that he be given time to do it. Priests and deacons from the three dioceses joined the bishops.